I’ve just been in Sydney for a couple of weeks – for a ‘grease and oil change’ and to see my little grandson who is now one. 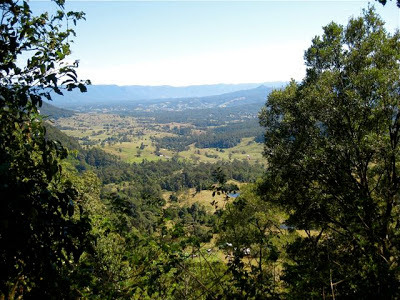 I love walking around the city and hopping about on public transport (non-existent in our small country town – bring back the train that used to link Sydney with Brisbane and get the trucks off the road!!). 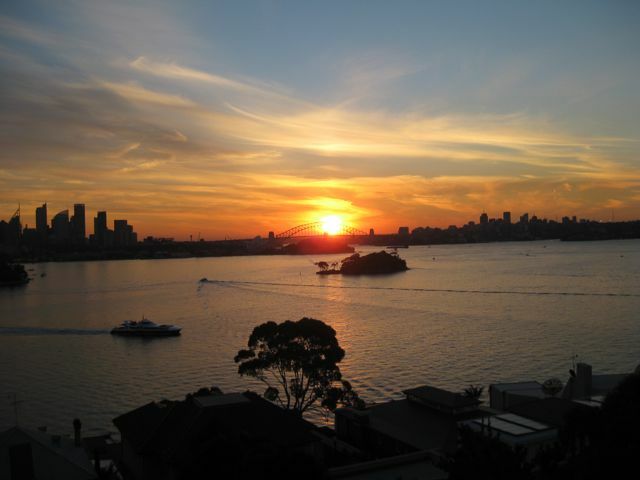 One of the benefits to getting older and being entitled to a Senior’s Card, is being able to travel around all day on public transport for $2.50 – that’s buses, trains and ferries – it’s fantastic. 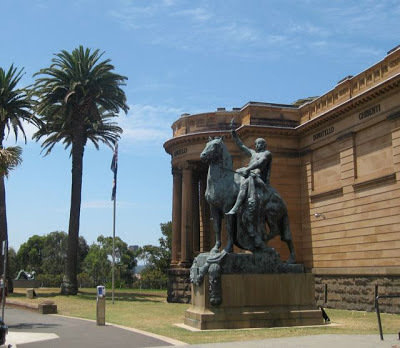 A visit to the Art Gallery of NSW is always on the cards. 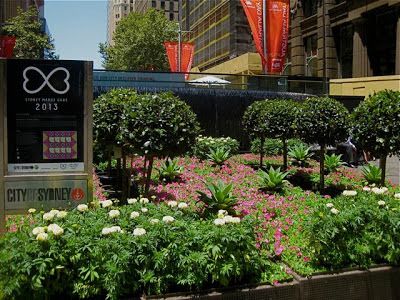 It starts with an amble through Martin Place (the pedestrian centre of the CBD), a stroll along Macquarie Street (with the preserved sandstone heritage buildings of Parliament House, The State Library, The Mint and Barracks and through Sydney Hospital and out into the Domain Parklands that surround the Royal Botanic Gardens of Sydney.) 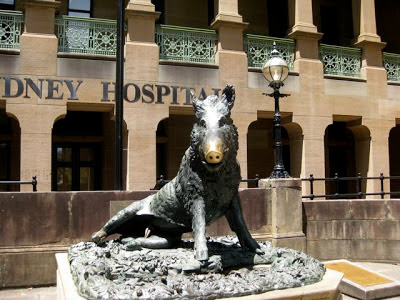 Just before you enter the hospital grounds don’t forget to stroke the snout of the imposing bronze boar – said to bring good luck – I can’t help giving him a pat every time I pass this way. The Gallery is perched on the harbour with wonderful views from inside and outside this lovely golden sandstone building. After the galleries of Europe, with their associated crowds, this is just such an accessible place to enjoy art. 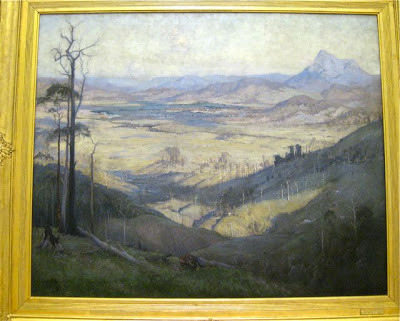 Its’ light filled rooms hold a fine collections of Asian, Australian, Impressionist and Aboriginal Art and I’m always finding something new – like this painting of the Tweed Valley where I live now. It was painted nearly 100 years ago by Elioth Gruner and I suppose the stark thing that struck me, in both senses of the word, is that it shows such a desolate landscape – through indiscriminate burning and tree clearing -so different to the verdant lushness of today. It gives me hope that there are maybe some things we are getting right. I was wandering around the gallery starving – waiting for a two hour session at the dentist to wear off. Finally, I made my way to the lovely cafe, overlooking the Woolloomooloo Finger Wharf – where many migrants, arriving after a long sea voyage caught their first glimpse of Sydney, – to try and find something soft on the menu! This dish was so simple in it’s conception, and so absolutely delicious that I sought out the chef to find out the recipe. It is very simple and no tricks to it at all. TIP: Never wash mushrooms – it ruins the texture – simply brush off any loose dirt. 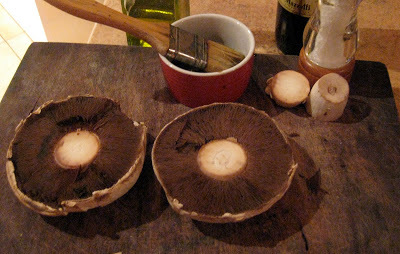 Brush mushrooms with oil, balsamic vinegar and sprinkle with salt and pepper. Place on a tray in the oven for 8 minutes. Mix ricotta together with herbs, parmesan and salt and pepper. Remove mushrooms from oven and pile ricotta mixture on top, bringing it to the edges. Place back in the oven for a further 10 minutes until ricotta has golden tinges. Serve with a wild rocket, pear and walnut salad with a balsamic dressing – the sweet, sharpness of the balsamic brings out the flavour of the mushrooms and ricotta. 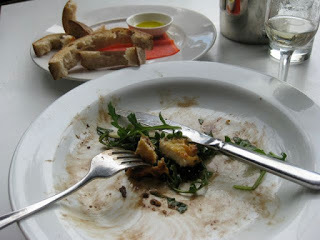 I had to make it when I got back home as I had simply wolfed down the one at the Gallery before I thought about taking a photo – notice, I couldn’t eat my crusts. 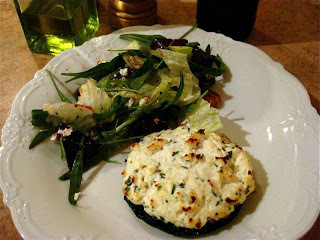 What better way to have your hunger sated – by visual beauty and baked mushrooms with ricotta? 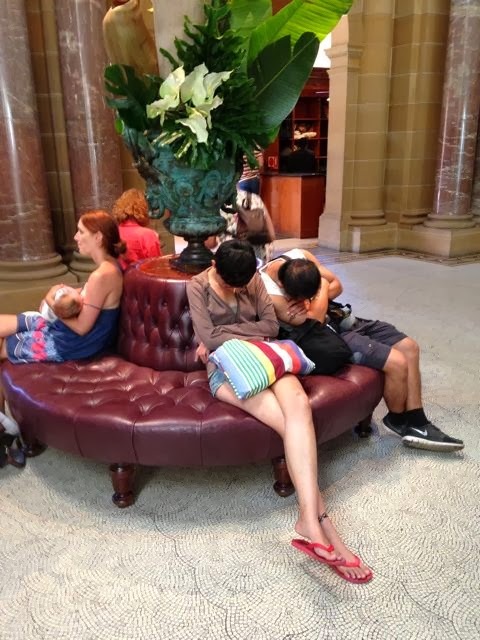 Not everyone finds the Art Gallery as stimulating as I do!